BRIDGEWATER, N.J. - The New Britain Bees didn’t have many opportunities, but took advantage of them when it counted. 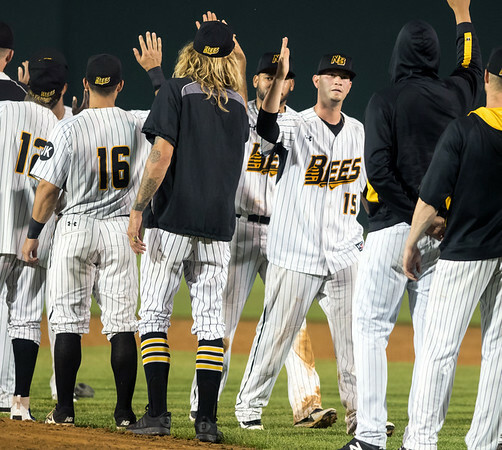 The Bees had four different players drive in runs as they began a four-game set on the road against the Somerset Patriots with a 4-3 win Thursday afternoon. The big hit in the game came in the eighth inning on a one-out, RBI-double by second baseman Jonathan Galvez. It provided an extra insurance run and made the score 4-2. Deibinson Romero drove in New Britain’s first run of the day on a sac fly in the first with Jovan Rosa adding a home run in the fourth tie the score at 2-2. Jamar Walton singled in Rosa for the Bees’ third run in the sixth. Jason Rogers continued his hot second half, going 3-for-5 in the game and scored the run in the eighth inning. Rogers is hitting .306 this season, second only to Brock Stassi on the team. Rainy Lara continued to prove why he has been the best starter on the Bees roster this season. Over 5 2/3 innings of work, the right-hander gave up just two runs against a Patriots lineup that is third in the Atlantic League in runs scored. His 3.48 ERA is seventh in the league among qualifying pitchers. Evan Scribner pitched a perfect ninth inning, picking up his 16th save of the season, the fourth-most in the league. The Bees have now won three in a row and are just three games behind the struggling Patriots, who have now lost four straight, in the Liberty Division. Posted in The Bristol Press, New Britain Bees on Thursday, 2 August 2018 16:29. Updated: Thursday, 2 August 2018 16:31.